But okay, you can live with the fact that you don’t know where he’ll be yet, because that will almost certainly be resolved before 98% of drafts. Yet what you won’t know is how much you can really count on him to be healthy, can you? Injuries to his elbow (2012) and lat (2013) limited him to only 42 starts over the last two seasons, and he missed a few weeks with right elbow soreness during 2008 and 2011, as well. 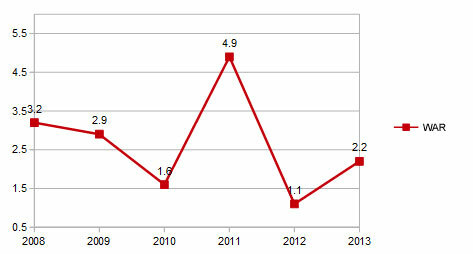 It helps, of course, that Garza took his regular turn after his delayed start to the 2013 season. Still, it’s not exactly a great track record. One of these things does not look like the others. If that 2011 really stands out as an outlier, it should. For his entire career Garza’s FIP has landed between 3.88 and 3.42, repeatedly coming in at the 4.15ish range. For that one year, he actually brought it down to 2.95. That great year actually had nothing to do with BABIP, which was higher than usual for him, but because he basically stopped allowing home runs. In a career that has routinely seen his HR/9 come in between 1.10 and 1.30, it was merely 0.64 that year, and he pushed his swinging strike percentage above 10% — all the way to 11.2% — for the only time in his career. Since that 2011 breakout, his swinging-strike rate has held steady at 9.8 while his K/9 has fallen from 8.95 to 8.33 to 7.95. More importantly, the home runs have returned, back to 1.30 and 1.16, and it really can’t be overstated how much that 2011 0.64 was an out-of-nowhere fluke. “6-1” to “4-5” still holds some weight, I suppose. Assuming no new health issues, Garza seems like a decent bet to post 180 innings with 10-12 wins and an ERA in the 3.80 range, again dependent on where he ends up, and that’s a worthwhile pitcher to have on your roster. It’s just not someone you want to over-extend your self to get, as some pitching-needy team is all but certainly about to do in the real world. We hoped you liked reading Won’t Someone Give Matt Garza A Home? by Mike Petriello!